So, you’ve purchased a brand-new portable band sawmill. Now what? Here are ten helpful tips and a beginner’s project to successfully mill your first log and gain valuable learning experience along the way. Setting up your new mill is a relatively straightforward process as portable sawmill manufacturers provide detailed instructions, which are easy to follow. However, there are always a few last minute checks you should perform before powering up your mill on for the first time. Make sure all supports are in place and in contact with the frame of the sawmill. Check the mill for level. True, it will cut a straight log as long as the bed is straight, but if one end is low, the carriage on a manual sawmill will roll on its own. Consider using wedges to fine-tune the mill. Is the blade ready to go? There are a couple of things to look for here. First, install the blade so that the teeth are pointed towards the sawdust exhaust. To adjust the tension, follow the manufacturer’s recommendations. Take off the guards and turn them by hand in the direction that the blade will be cutting. The band wheels should turn freely and smoothly. The body of the blade (the narrowest part) should be centered on both band wheels. If necessary, adjust the tracking bolts to center it. On some sawmills, adjusting the tension changes the tracking, so check tracking every time you change the blade. When you replace the guards, make sure that any safety switches are engaged, or the engine may not start. You’ve got your mill set up and ready to cut. The bed is well supported and perfectly level. The fuel tank is full, oil level is at the top mark on the dip stick and a brand new bandsaw blade is mounted and tracked on the bandwheels, ready to chew its way through the first piece of wood. 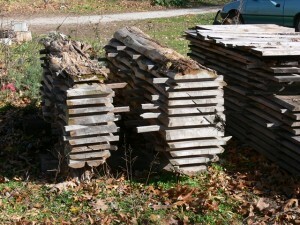 You will no doubt be tempted to cut up a monster log you have set aside and waiting or an expensive clear cherry tree. But your first log will be a learning experience, so set your special logs aside for now. 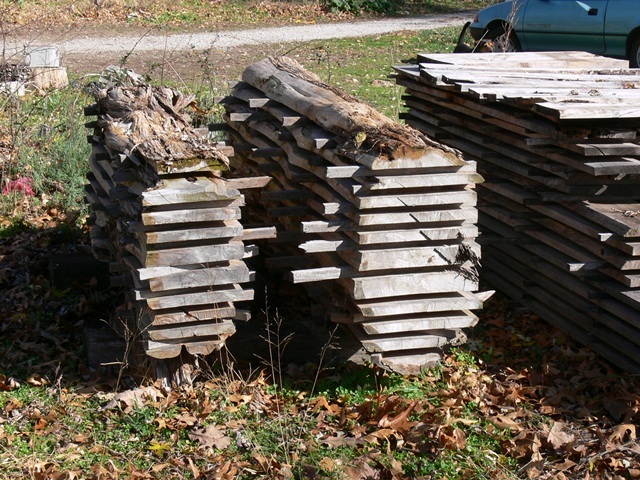 Instead, pick a lower-value straight softwood log, around eight feet long and about 14” in diameter depending on the size and capacity of your mobile sawmill. This will suit your first milling project well. As you mill lumber, you will need blocks to set the boards on to get them off the ground and you will need spacers (called “stickers”) between each of your newly cut boards to allow air to circulate through the stack, so your lumber will dry properly. Creating blocks and stickers is a perfect first project. Trust me — no matter how many you cut, you will always need more! 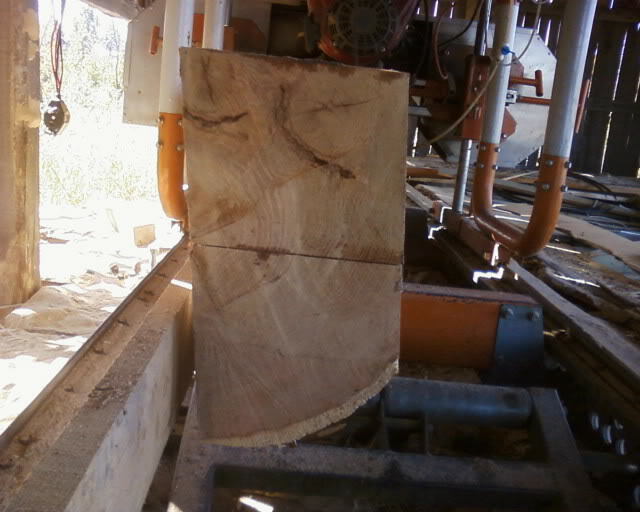 Before loading your log, make sure the log stops are up, or you may roll the log off the back side of the mill. You will probably do this eventually, but there is no need to make this mistake on the go around. In general, sawyers prefer the small end of the board at the start of the cut, but this is not a hard rule. It just makes it easier to see where to start the first cut when you begin milling. With the log in place and firmly clamped down, it is time to map out what it will become. So, let’s plan this milling project out. You won’t normally draw out your cutting plan on the end of the log, but it can help you visualize your approach. The idea is to square the log into a “cant”, then remove boards from each side until you wind up with a 6×6 in the center. If possible, it is best to have the growth rings centered in the 6×6 block, so the wood will be less likely to warp as it dries. This is not critical for this blocking project, but it is a good skill to learn. All of the “side lumber” will be 7/8” wide and you will later cut it square to make stickers. Mud and grit will dull a new blade in just a few seconds, so check the log along the path the blade will take when it cuts. If you see mud or grit you can either remove it (a hatchet works well for this) or turn the log so the blade enters into clean wood. It doesn’t matter if there’s grit on the side of the log the blade exits by the way. You just don’t want the blade to be dragging it through your cut. If the log is fairly straight and round, come down about an inch from the top of the log. With experience, you’ll be able to accurately judge where to start. But on this particular log, if you cut a little heavy on this slab or have to make another slabbing cut, it won’t matter too much. Take a deep breath, bring the engine up to full throttle and ease the blade into the log. You probably won’t even be able to feel when the blade starts cutting. It will be a little like pushing a shopping cart (but without the invariably wobbly wheel). When the blade exits the other end of the log, disengage the throttle to bring the blade to a stop. Remove the slab and take a good look at the cut. It should be straight and only have fine saw marks in it. Most sawyers turn the log 90 degrees after the first cut so the flat cut side rests against the log stops. If the stops are square to the track, this will give you another square cut. Make sure the log stops are secure and below the cutting line before you clamp down the log. On most mills, there is nothing to prevent you from cutting into a log post and quickly ruining a blade (and your log post). The second slab will cut much like the first. The third and fourth slabbing cuts should start on even inch marks, since you want a 6×6 out of the center and you will be lowering the blade 1” after each cut. After you’ve cut the fourth slab, you are ready to start making boards. Simply cut down in 1” increments until you are about 3” from the center of the log, then turn the log 90 degrees and repeat. When you cut boards on the 3rd and 4th sides of the cant, stop at the 6” mark. You should wind up with a 6×6 cant and a number of boards of various widths. Before you take the block off the mill, check it for square and accuracy. The ends should be a perfectly square 6” by 6”. If the block is square, but not exactly 6” by 6”, you may need to adjust the scale a bit. If the sides are parallel, but not square, the log stops are not square with the mill. If there is a taper to the block, the blade itself needs to be adjusted so it is parallel to the mill. Follow the mill manufacturer’s instructions to do this. The good news is, if you are not square, this is just blocking and you’ve learned from your mistakes. 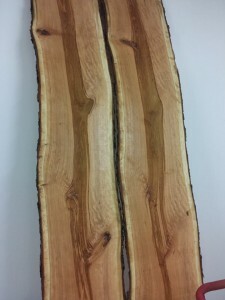 Aren’t you glad you didn’t start out with the nice cherry log? To cut the stickers, put the boards back on the mill edgewise. Four at a time is enough for starters. Pay close attention to the position of the log stops as you cut the strips. You’ll want the stops high enough to support the boards, but be sure to stop cutting before the blade is low enough to hit them. Then turn the board over so the flat edges are against the bunks, lower the stops and finish off the strips. Leave the last strips 2” wide so that you don’t have to cut too close to the stops and clamps. Most lumber piles are about 4’ wide, so you’ll want to cut the block and stickers into at least 4’ lengths. Congratulations…you’re now a sawyer! The first slabs can go onto a pile a convenient and safe distance from the mill, where they won’t be in the way. Maybe you’ll use them for firewood next winter or perhaps you have other plans for them. Most manufacturers recommend loosening the blade when you stop cutting for the day to relieve pressure and extend their cutting life. Throw a tarp or other covering over the head rig if the mill isn’t in a shed, shake the sawdust out of your pockets and call it a day. 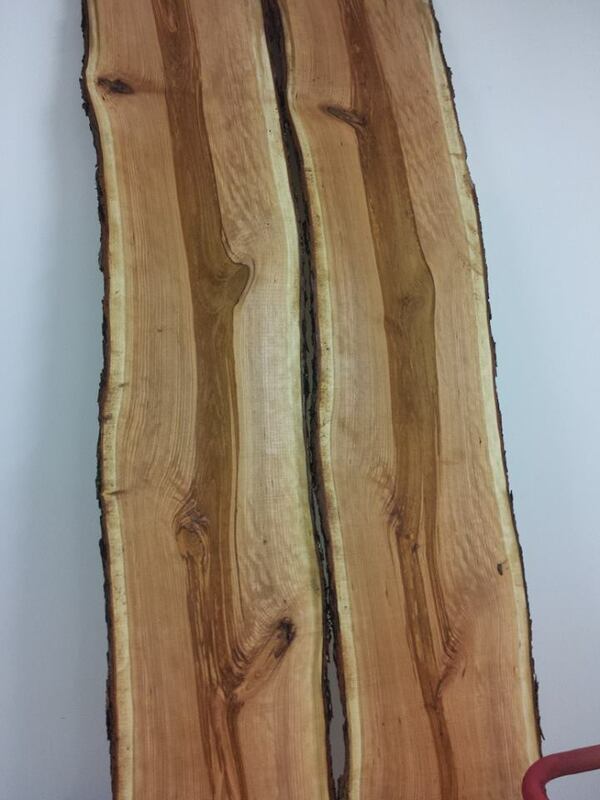 After a few more practice rounds you can confidently turn your cherry log into a work of art or sell it to the highest bidder. Excellent, specific, info — very helpful to a first-timer. Thank you.